If you're looking for a creative way to display your photos, this is the way to go! Paint the edges of the wood shape with the copper paint (around all sides as well as 1” in on the top of the shape). Set aside to dry. Once the paint dries, pull out desired print from the stack. Place it face down in the work area. Place the wood shape face down onto the back of the paper (paint side down) and trace around it. Retrace the butterfly onto the back of an additional piece of cardstock in the same manner, this time focusing on the bottom and middle sections of the butterfly (the smaller tails and center area). Cut out all the pieces, making the main butterfly cut out smaller than the actual butterfly shape as shown. Fussy cut several shapes from the stack (flowers, accent pieces for the top of the butterfly). Lay all the pieces on top of the wood. 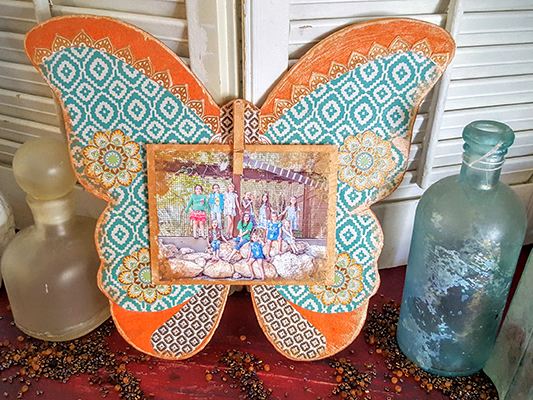 Arrange the additional shapes as desired, and then adhere everything in place with Mod Podge. Dry sand the edges of the wood. Paint the sanded edges with copper paint to create a gilded distressed look. Paint the clothespin with the copper paint as well. Set aside to dry. 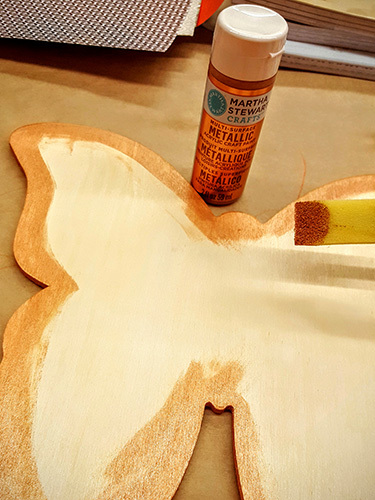 Once the paint is dry, attach the clothespin to the center of the butterfly as shown. Add in a photo and enjoy! 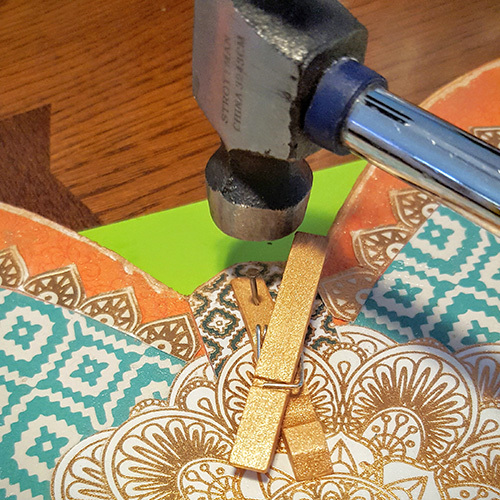 To attach the clothespin, use wood glue, a small nail, or both.